Mac screen recording with audio, keystrokes, and mouse clicks. Providing the power and features to communicate your screen experience. 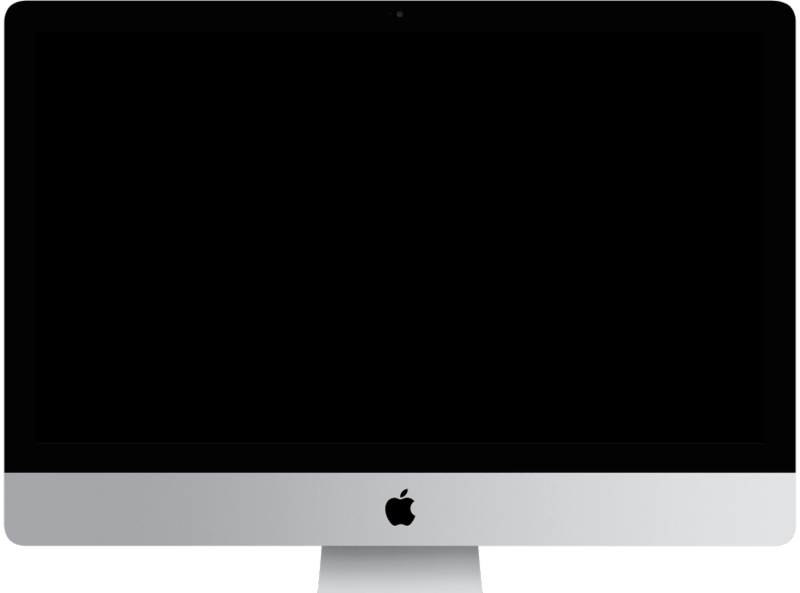 Screenflick is a macOS app focused on the core essentials of screen recording: providing the highest quality screen and audio capture, and delivering the key tools needed to communicate your screen experience to your viewers. Screenflick also strives to be as efficient as possible — both with the resources it uses, and the user interface it offers. Built around a smart recording engine, Screenflick uses processing power efficiently while capturing even the highest resolution and quality of your Mac’s screen and audio. The user interface helps you be more efficient by requiring less setup before recording and providing more flexibility before exporting. Video, audio, keystrokes, and mouse clicks are recorded in separate tracks allowing you to customize them after recording — so you don't have to re-record everything just to change where the keystrokes are displayed. Include the whole screen, a section, or a specific window. Have a fixed space, or have the view follow your mouse. 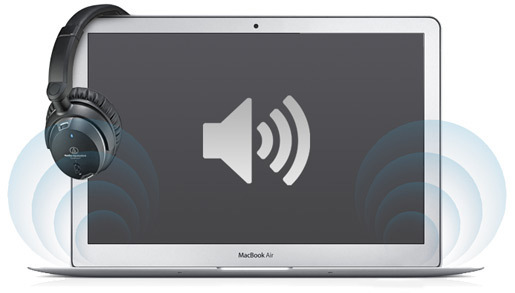 Include system audio, your Mac’s microphone, or external mic. Record a webcam at the same time to overlay on the video. Create time-lapse screen recordings of long projects. Delay the start to get yourself ready. Use a timer to automatically stop recording. Export to multiple sizes, frame rates, formats whenever needed. 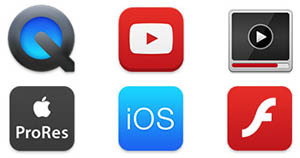 Compatible with Mac, iOS, AppleTV, Windows, web browsers. Add overlays of keystrokes and mouse clicks. Trim excess beginning and ending frames. Add watermarks and meta data for title and description. Run Quick Test exports to verify settings work as expected. Save presets for export settings to use them again. 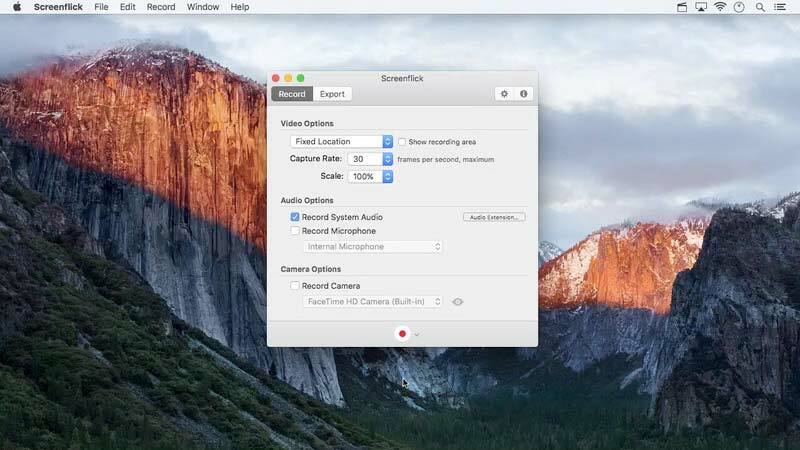 What makes the best screen recorder for Mac? We think it's doing just what you need, and doing it really well. Try it for yourself and see how Screenflick's focus on smooth recordings, capturing audio, and displaying mouse clicks and the keyboard, makes capturing high quality Mac screen recordings a breeze. Screenflick focuses on each of its tasks with minimal distractions. When you want to start a new recording, Screenflick is ready to go. There’s no bloated project setup, no now-and-forever choices to make for exporting formats. Instead, you simply select which system features to record (screen, audio, webcam) before setting the stage size of what you want to record. OK, so there are some clever options like delaying the start, setting a maximum time limit for semi-automated recordings, and a few others, but that stuff is neatly tucked away until you need it. Click the image to see the whole window. Silent movies are a thing of the past (or present if you’re trying to capture system audio with QuickTime player). Screenflick bundles everything you need to capture system audio from all sources playing on your Mac—whether coming from a game, a web browser, or any other application. 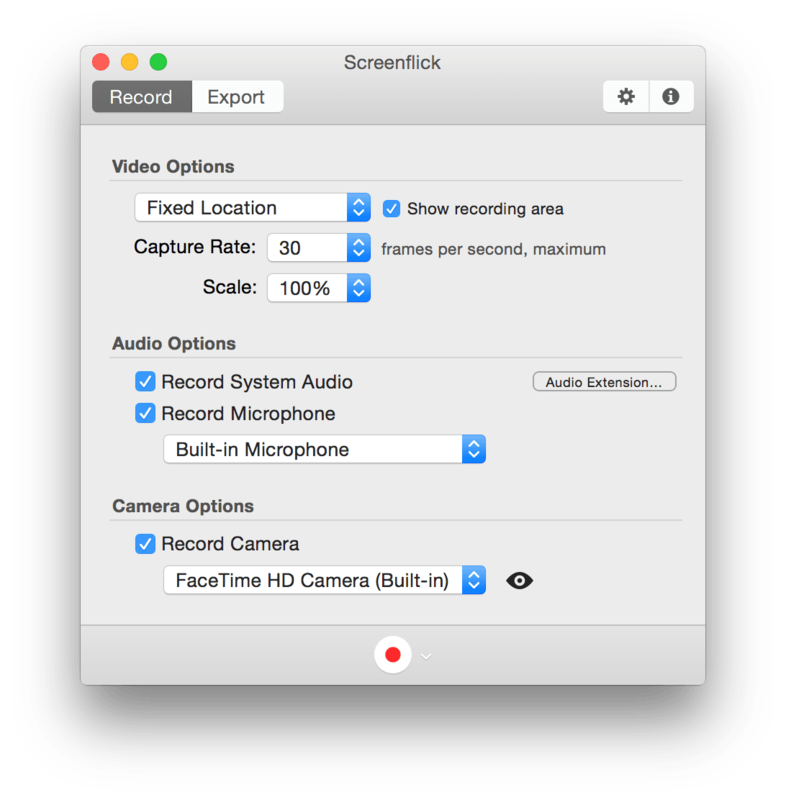 Screenflick also records from the Mac’s internal microphone, from an external USB microphone, or any audio input of your choice. It’s as easy as clicking one checkbox. The core of Screenflick is built around a highly-optimized recording engine which captures very large resolutions at high speed and high quality. More than taking advantage of the graphics processor and multiple processor cores, Screenflick is coded for exceptional efficiency. This means that Screenflick can capture those super smooth and sharp 60 FPS animations even on 5K retina displays. However, sometimes the opposite is needed. You have a 5K display, but you only need a 1080, 30 FPS video. This is where Screenflick’s efficiency-obsessed recording engine uses more brains than braun by capturing only what’s needed. This can reduce the workload by over 7 times, and leaves processing and battery power for the real-time data crunching in your applications. 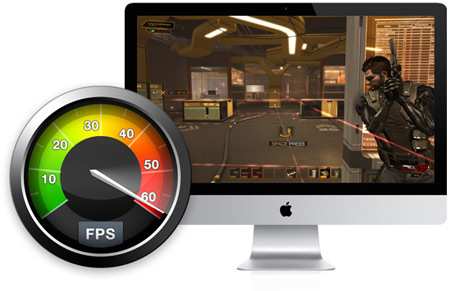 See Screenflick record Mac games fullscreen at 60 fps. Obviously in video podcasts for training, reviews, and demos it is useful to show key presses on screen, as well as mouse clicks. But, sometimes you think you don’t really need it. Then you change your mind. Ugh. Start the recording over? Nope! As soon as you start recording, Screenflick always captures keystrokes and mouse clicks. You can decide whether to display keystrokes and/or mouse clicks when you export the movie. They’re always available to use or not. By the way, macOS itself blocks programs like screen recorders from capturing passwords, so no need to worry about that. Record from your Mac’s built-in FaceTime camera, an external webcam, or any other connected video camera — at the same time that you’re recording the screen. People pay more attention, learn more, and build better fan connections when they can see the person presenting the training, or contorting over their game controller battling the undead hordes. So, put on a clean shirt (please), and have Screenflick create a picture-in-picture overlay of your webcam video on your screen recording. Where should it go? How big should it be? You can experiment and decide that when you export the movie. No need to start over when you realize that the other corner would be better. One of the major unique features in Screenflick is the ability to export the original full-quality movie multiple times with different scales, qualities, and file formats. Other applications record directly to a final movie format. Not only does this limit your recording’s usefulness, it can negatively impact recording performance and sacrifice video quality. Using Screenflick, you record a movie once, then you can create small, low-bandwidth movies, large, high-quality movies, and even export to different file formats, without having to record all over again or use another program. Use Screenflick Remote to control Screenflick running on your Mac. Using the remote, you can start a recording, pause, resume, and stop, all without the Screenflick interface being visible in your final recording. You can even control Screenflick running on multiple Macs at the same time! This is just another example of how Screenflick helps you make a great screen recordings on your Mac. Start capturing the best video possible for your projects. If you've ever wondered how to record your screen on a Mac, now you know. Screenflick provides the power and features to communicate your screen experience. Learn more about how to use Screenflick. 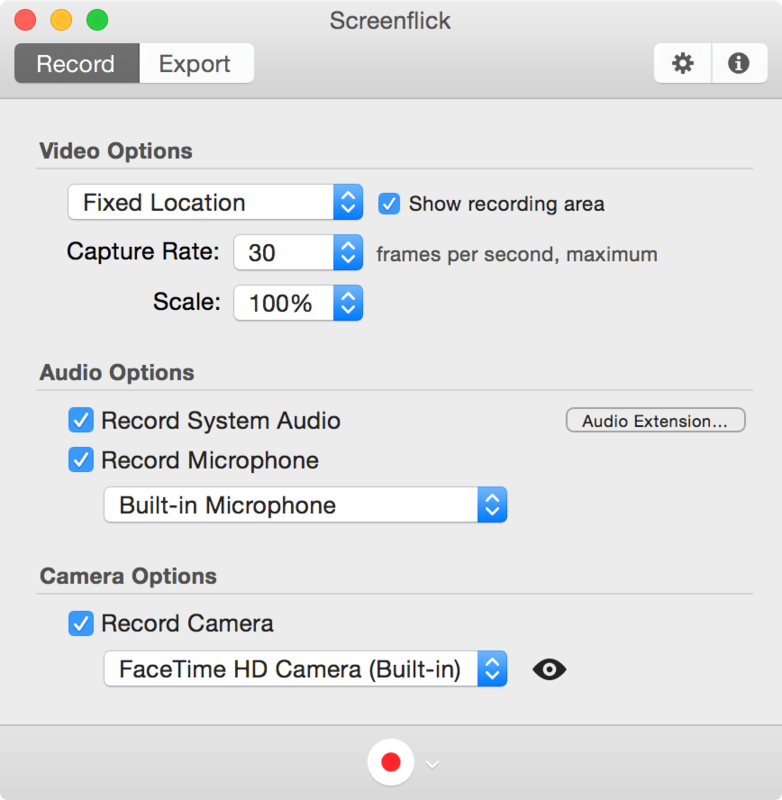 Not only can you record the entire Mac screen, but you can also record a part of the screen. This keeps your movie focused, and saves disk space and processing power for other applications. When recording an area smaller than the whole screen, you can choose to have the screen recording “camera” smoothly follow the mouse cursor.  Although Screenflick can record your Mac's screen at its full resolution (even at full Retina size), sometimes it doesn’t mean you should! For times when you want to record fullscreen but export at a lower resolution, you can record at a smaller scale, saving precious performance and battery for other tasks. Show off your hours-worth-of-work project in a minutes-long movie. Record a movie at a super low frame rate, then speed it up on export to create time-lapse screen captures. Perfect for exhibiting your digital art skills. Before exporting your screen recording, you can preview the movie with all of the keyboard and mouse options. Start, stop and scrub through your video with audio playback as well. In Screenflick you can create presets for your video, audio, keyboard, and mouse options. Fine tune your settings and save them as a preset, so you can use them later in a snap. Screenflick creates QuickTime mov, MPEG-4 mp4, and Flash f4v movie files, letting you create movies you can watch anywhere — on Mac and Windows, iPods, iPhones, iPads, and Apple TVs. You can also export to other formats, such as Windows Media, using QuickTime component plugins. Put your stamp on it. Before exporting your movie, you can drop in an image to “watermark” your movie so everybody knows you created it. You can also add metadata tags which will be embedded into the movie file. You have the best screen recorder EVER!!!! Thank you so much!!!!! I just got Screenflick, it’s great! Best screen recorder I’ve ever purchased. If you are looking for one, worth the price. 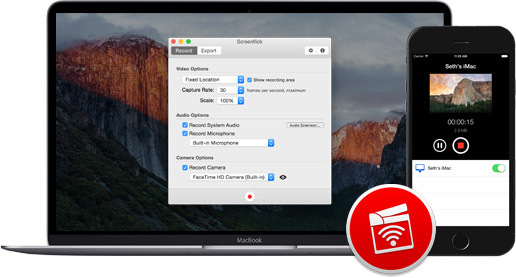 It’s great software and if you want to do screen recording on a Mac you should use it. And no, they’re not paying me. This love is pure, special, and not a little disturbing to the people around me. Stop judging. When it comes to screen recording, you can rest assured that you will have one of the best and easiest experiences with Screenflick. Screenflick 2 is a sublime experience that gives you a great end result. Just to mention that Screenflick is a highly respected part of our software suite. Very robust, intuitive and a pleasure to use. I just wanted to thank you. I’ve owned a Screenflick license for a few years now and it’s one of my top 10 favourite applications. You regularly update the app, giving me utmost confidence in the product. Just wanted to tell you that Screenflick is amazing and you guys are saving my life :P kudos, it’s really great. Want to review Screenflick in an article or video? Get in touch! Need to take and share screenshots? Check out Linkshot, to capture, markup, and share screenshots, screen recordings, images, and movies from your Mac.